Shaw internet was down at Market Mall today. It was kinda sad and funny to see so many stores with signs saying, "Cash only" due to their card machines down due to the internet issues. I have dual WAN configured (automatic failover to Telus 50), so it's unlikely I'd have noticed a Shaw outage unless I was downloading something. But I just tested on Speedtest.net and hit 653.44 Mbps down, 17.53 Mbps up. This is in Garrison Green. When I was having brutal internet issues (turned out a power surge messed up my router), the speed tests that went through a Shaw server always returned exactly what my plan said it should, but any actual usage would show how bad it actually was. 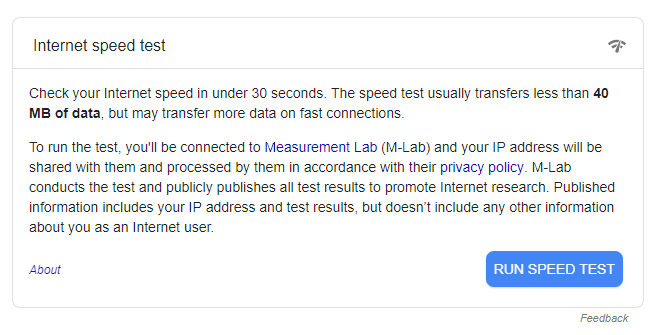 It turned out the only truly accurate test I would get consistently was the in-results one that popped up on google when you search "internet speed test". When other speed tests would show 60+ mbps, this would show 1.5 mbps. Once I replaced my router, they were reading nearly the same numbers. Just something to consider when running the tests. I'm running a Ubiquiti UniFi Access Gateway 3-port and my home is hardwired, so I'm pretty confident in my network infrastructure. Last edited by TorqueDog; 02-11-2019 at 11:21 AM. My SHAW has been surprisingly decent through this cold snap. I typically expect there to be issues. Indigo Books in Dalhousie Station was down as well. Do we know it was a Shaw issue at Market Mall? We are in the NW and lost our shaw (tv and internet) for a bit a day or 2 ago. I assume it was tied into this - i.e. a broader shaw outage problem. I was chatting with a cashier who said the debit/credit machines were down because the internet was down. She said the machines in the stores on Telus were fine, but anyone on Shaw in the mall was essentially cash only that day. Yah there was a substantial network outage, encompassing a bunch of the NW, hamptons, bowness, etc for hours. I've been on and off of a list of incidents now multiple times. Been told its a DNS issue, but I'd been running CloudFlare as my main DNS for a while, and tested with Google as well with no luck. I keep getting asked to do traceroutes, but its not a hop issue, I'm positive its packet loss because of how it behaves. I've now sent them video of the buffering on the home network, as well as a hotswap onto my cell data with no buffering and immediate viewing, and then back to home network with buffering. I also ran traceroutes using both the home network and the cell network, and the cell network (unsurprisingly) takes 7 more hops to get to the source server, with equal latency at the opposite end, but with none of the symptoms. Man, Shaw used to be pretty decent. Even if there were issues, customer service was pretty easy going and happy to help. Lately, it seems like whoever is at the top is slashing in all the wrong places and things are going to hell in a hand basket fast. Customer service can pretend to be in PEI and Toronto all they want, I'm pretty sure customer service has been outsourced to India. Results between wired directly to the modem or over wifi are the same. Hitron modem in bridge mode connected to the last Model Apple Time Capsule. I also have an Airport Express upstairs. I live in a brand new house in a new neighborhood too. Frustrating that I was excited to be upgraded to 300 come to find that I am well below 150. I'm paying for 300 but contemplating going with Telus 50. We can no longer watch clear tv in the evenings. I can barely stream Netflix on my hardwired AppleTV in the evening. Changing the modem out today - we'll see if it helps any. I swapped my Hitron for the XB6 last night. It seemed like it was slightly more stable, but it's only been half a day. The top speed seemed slower than the Hitron, but the slowest speed seemed far more reasonable to the Hitron (Seemed like my speeds ranged between 180-310 XB6 vs 60-330 Hitron). I don't know if there's a modem firmware update that will still need to happen though. I think I'll get a better idea by the end of the weekend. No drops that I have noticed yet though. That's encouraging. I was under the impression from Shaw that Internet 300 (as in 300 Mbit service) required the XB6, as I swapped out my Hitron for the XB6 in order to take advantage of it. Before Internet 300 was released (and thus predating this speed double-up), Internet 150 could get away with the Hitron. Wired to the modem or wired to the router, ie: the Apple Time Capsule? I'd try going direct to the router, and then direct to the modem if you still see low speeds. If the results directly wired to the bridged port of the modem yield the same low speeds, you definitely have a case to tell Shaw to come fix your sh-t.
Last edited by TorqueDog; 02-15-2019 at 01:15 PM. I was under the same impression that the XB6 was required for 300+. At least, that's what I kept hearing before the free upgrade to internet 300, so I think we heard the same thing. However, I was asking about it in December and someone at Shaw said Hitron was ok for internet 300 and wouldn't upgrade me. I asked again last week and they offered it, so I jumped on it to see if it would help.